For the 9th consecutive year, the 3.916 Nets will be giving good boys and girls a chance to talk to Santa Claus via the magic of ham radio. The '3916 Santa Nets' will be held at 7:30 PM every night from November 28 through December 24th. The Santa Nets are open to all licensed amateur radio operators who wish to invite kids to their shack to talk to Santa. Third party rules will apply. For 2014, The 3916 Santa Net will be on the air nightly during the Christmas season. The net time is changing from 8:30 PM Central to 7:30 PM Central. Pete Thomson (KE5GGY), commented on The 3916 Santa Nets. He said, "Christmas is our favorite time of year on The 3916 Nets. Each year on the Santa Nets we are blown away by the response. It's incredible to hear the excitement in kids' voices as they talk to Santa Claus on Ham Radio. Based on comments from last year, we're going to have the Santa Net every night during the Christmas season and we're moving the net back an hour so kids won't have to stay up too late." Thomson added that The Santa Nets are a great way to let kids experience both the magic of Christmas and amateur radio. He said, "We encourage hams to get their kids, grand kids and even neighbor kids into their shacks to participate in the Santa Net. The kids love talking to Santa and we get an opportunity to show a young person how amateur radio works." 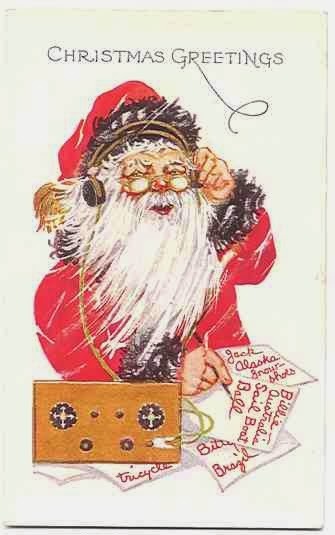 Each evening, The 3916 Santa Net will start at 7:30 PM (Central) on 3.916 MHz. Pre-net check-ins will be taken on the air starting at 7:15 PM. You can also do a pre-net check in by emailing ke5ggy@gmail.com. For more information on The 3916 Nets or The Santa Net, contact Pete Thomson, KE5GGY at ke5ggy@gmail.com.